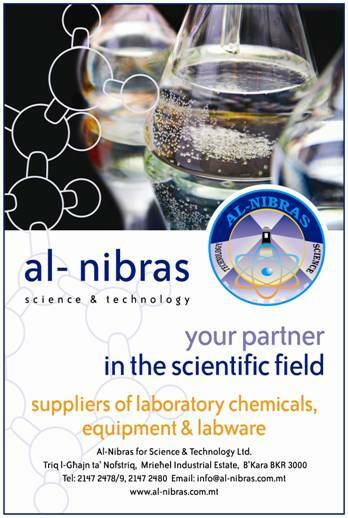 Al-Nibras for Science & Technology was established in 2005 as a Limited Liability Company in Malta. Although still in its early stages, the company, through its off-shore branch has been supplying educational and laboratory equipment, analytical instrumentation, laboratory chemicals and consumables to North Africa since 1991.Through these years, the company has built a portfolio of renowned companies which are exclusively represented in North Africa. In view of the fast-growing pharmaceutical industry in Malta and backed by the agency of two major companies in the scientific field, the company decided to extend its services to the local industry. Al-Nibras for Science & Technology Ltd. was established as a Limited Liability Company in accordance with the Companies Act, 1995. Distribution agreements for Malta were reached with Thermo Fisher Scientific, a world-leading manufacturer of analytical instrumentation along with Sigma-Aldrich, manufacturer of laboratory chemicals and lab ware. The first business relationship was established with a local pharmaceutical company. Installation and commissioning of the first analytical instrument in a petroleum company. Another pharmaceutical company has been added as a valued customer. Broadened our services to various private-owned and governmental companies. Relocation of our new offices in Mriehel. Traded for the first time with an Educational Institution. Another step towards the company’s main objective with the addition of a major pharmaceutical company as our client. New warehouse facility in Mriehel. Distribution agreements for Malta were reached with Isolab Laborgerate GMBH, manufacturer of laboratory glassware and lab ware. An exclusive distribution agreement reached with Flores-Valles, manufacturers of steel laboratory furniture. Distribution agreement for the distribution of Azlon®, MBL®, Pyrex® and Quickfit® glassware and re-usable plastics reached with Scilabware Ltd.
Al-Nibras for Science & Technology Ltd. ranked as the best chemical supplier in a well renowned pharmaceutical company. The list of customers we serve is further broadened with the addition of other pharmaceutical companies. Installation and commissioning of several powder testing equipment in a tertiary educational institution. Distribution agreement reached with Sterilin Ltd. for the distribution of Sterilin® single use plastics. More pharmaceutical companies added to our customers portfolio.